Hi. Long time no hummus. This hummus is the result of some ultra spicy, locally made perishable harissa and sweet beets. Although this particular harissa was far courser than any other harissa I've purchased, the standard stuff below will also get you into trouble in a good way. Verdict: sweet and spicy hummus will blow both your mind and color palette. In a food processor, beat everything but the chick peas, until smooth. Pulse in the chickpeas until smooth - reserved beet liquor to smooth out. Top with extra harissa and olive oil. Serve with purple potato chips and beet chips if you're really feeling this color scheme. 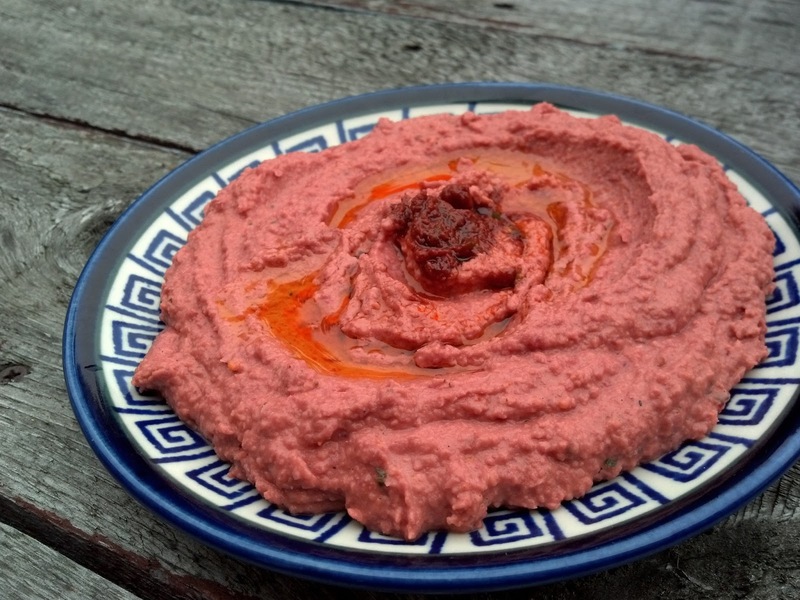 I love beets and this hummus is the perfect idea along with pita bread! I love your hummus posts! You need to write a hummus cookbook! Katerina - Thank you and love your taste! Greg - Hey there, I am still blushing, forever blushing! Not rude at all. Anna - Haha oh I would LOVE to! Thanks for the inspiration. You're gettin' crazy with the hummus there, TALF - love it! What non-local to you, but possibly local-to-me harissa would you recommend? Diana - Hey TALF! I would recommend the one in the yellow tube! Not sure what brand it is, but the label is very beautiful and sort of retro looking.